Pictures of Bhore ghat: Monkey Hill and Khandala. All the pictures are by Dr. Shirish Yande. These are the views from 1990s. View at the Monkey Hill Cabin (MHC). All descending trains and locomotives stop here for a few minutes to prove their brake power. 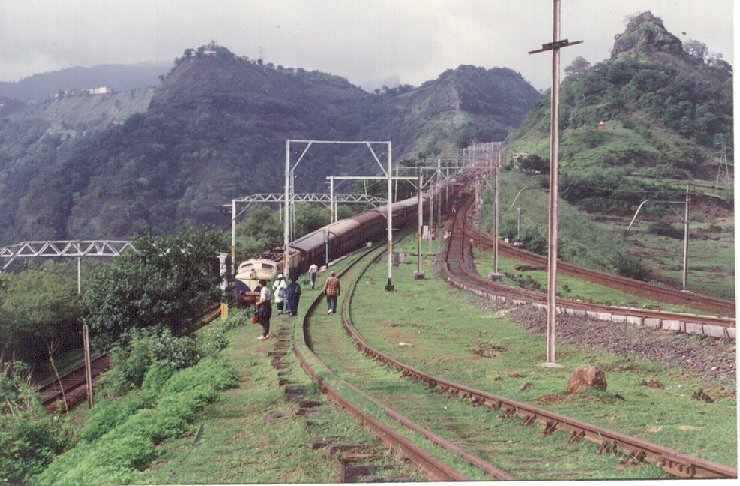 If a train cannot stop at the MHC, then it is led up the catch siding on the hill in front where it brakes due to gravity. 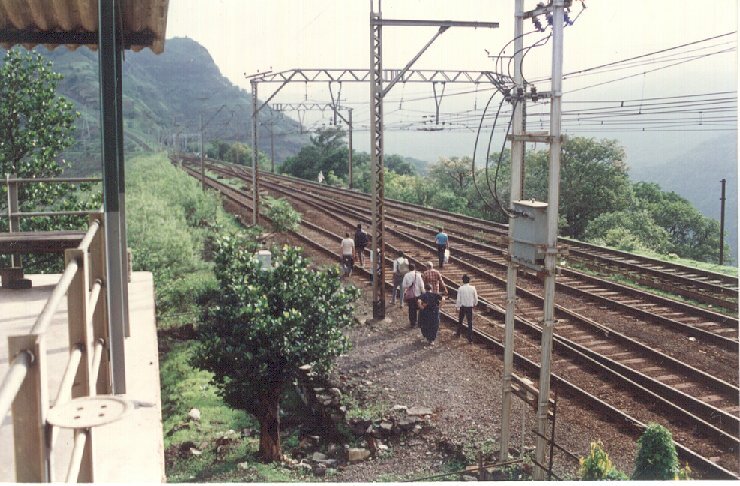 The members of the Model Railway Society of Pune (MRSP) walk towards the catch siding only just visible on the hill ahead. This is a shot from the Monkey Hill signal cabin. 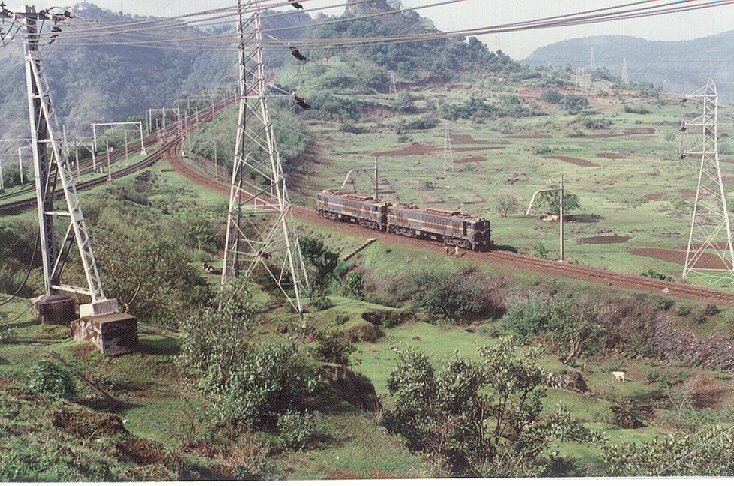 As the MRSP gang climb part of the way onto the catch siding, the 7304 Up Sahyadri Express departs the MHC after the stipulated waiting period. Note that the catch siding tracks are roughly laid and without catenary. 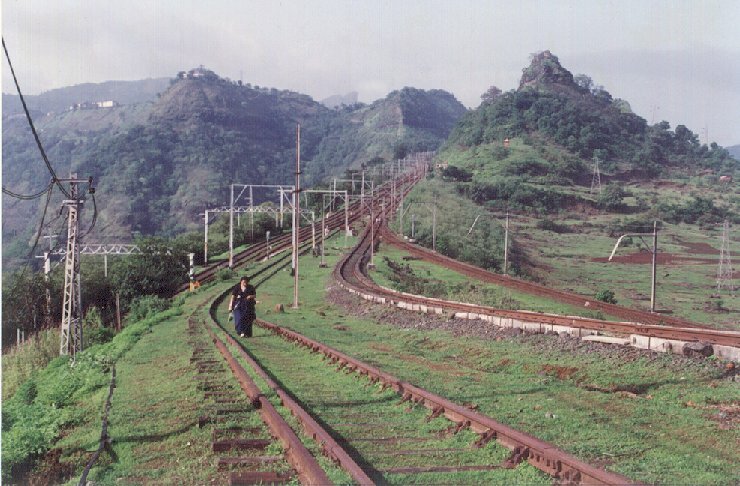 The secretary of the MRSP, Mrs. Lata Joshi climbs the catch siding. 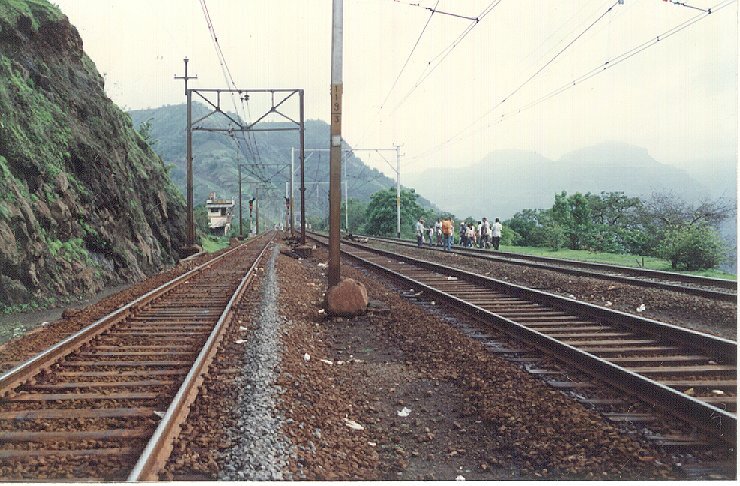 Of the main lines, the two lines on the left are the older tracks, while the one on the right is the one that is laid later to ease the congestion through the ghats. 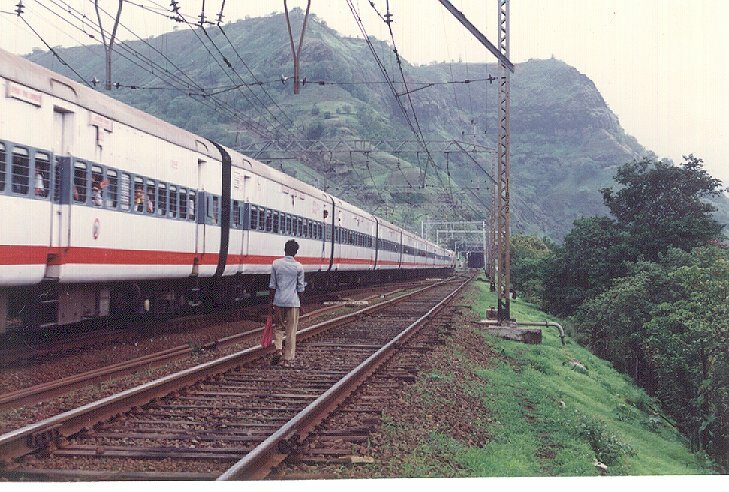 A pair of WCG 2 bankers descend the ghats to Karjat to be available to push trains up the steep slope. These are taking the 3rd line via Nagnath. 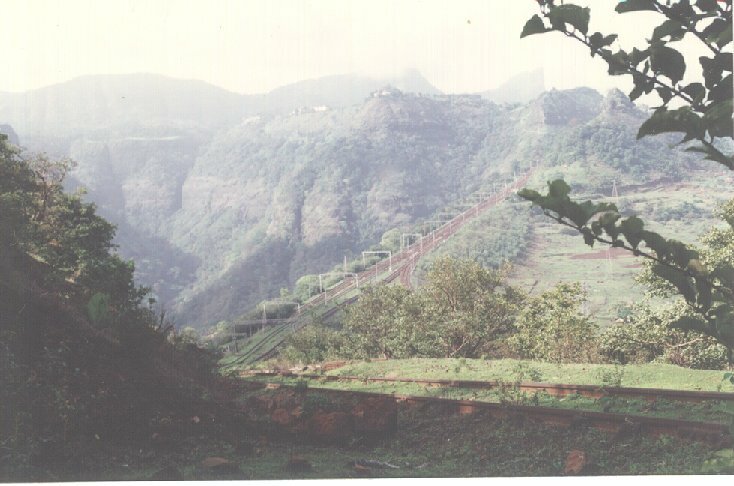 The high tension electricity pylons are the South East 1 and 2, which are the feeders to the traction substations all along the Mumbai - Pune route. All the way to the top of the catch siding, the splendour of the ghat can be seen, The sharp peak at the horizon is the 'Duke's Nose'. 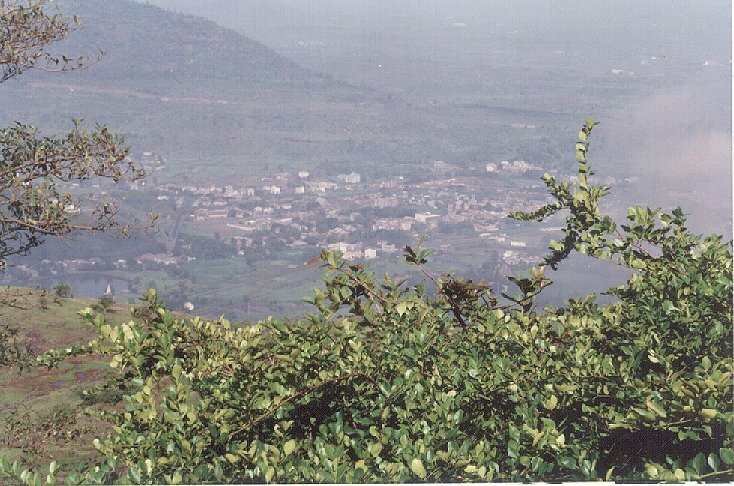 View of the Khopoli town from the ghats. The cloud may be natural or a result of the steel mill and other heavy industries. 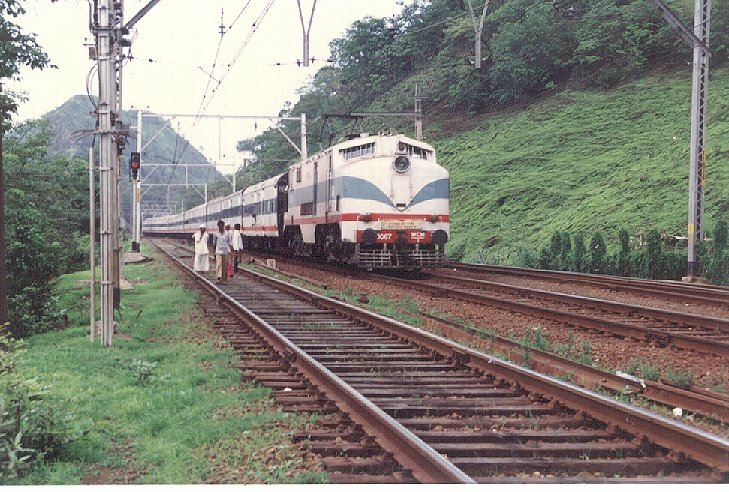 The crack train through this section, the 2124 Up Deccan Queen preparing to stop at the MHC signal. The livery matched WCM 1 loco 20067 easing it's precious train after the brakes charging halt. Monkey Hill is famous for ... Monkeys ! A large number of these wait around the stopped train and receive food from the passengers. Unfortunately there are none in this picture. Nowadays there is a campaign by the various pro-ecology groups to prevent large amount of paper and plastic garbage being dumped by waiting passengers at this point. All it takes is for the driver to release the brakes and gravity rapidly accelerates the train. The WCM 1 races towards the green advanced starter signal of the MHC. As the green signal is given, it means that the train can proceed at full booked speed (50 Kmph !). 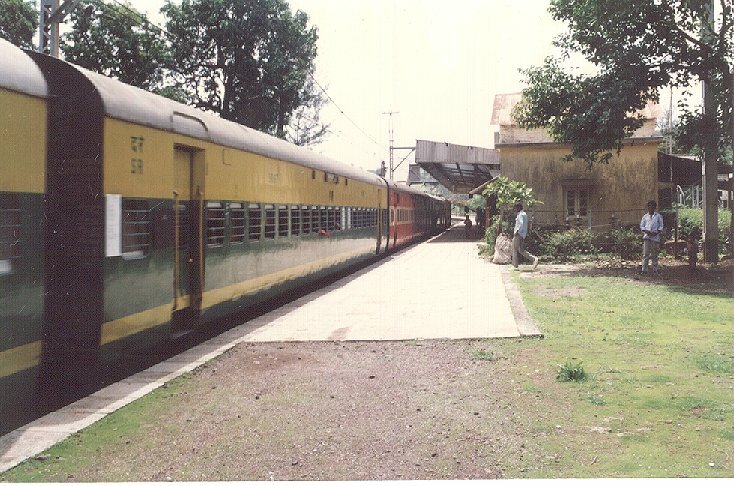 The train is taking the road 2 via Thakurwadi as indicated by the clear signal. If the train was to take the 3rd line, the signal would have been yellow with diversion to the left. WCM 5 20098 powers the 2113 Dn. 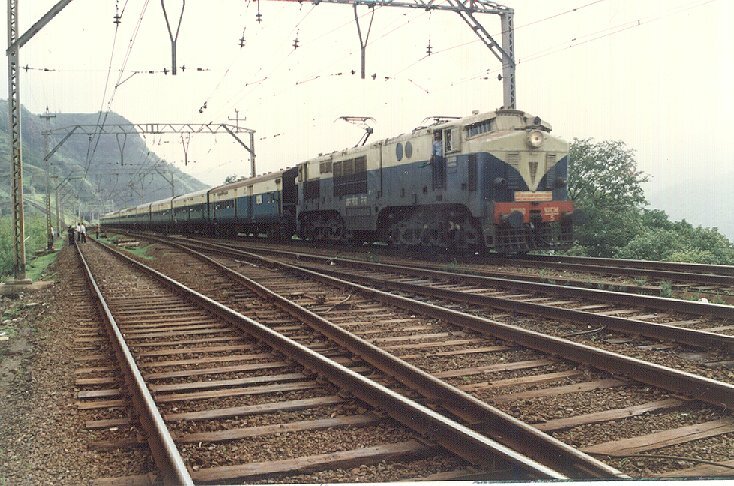 Indrayani Express towards Pune past the MHC signals. The train is being pushed by one or two (or even three !) WCG 2 bankers from the rear. 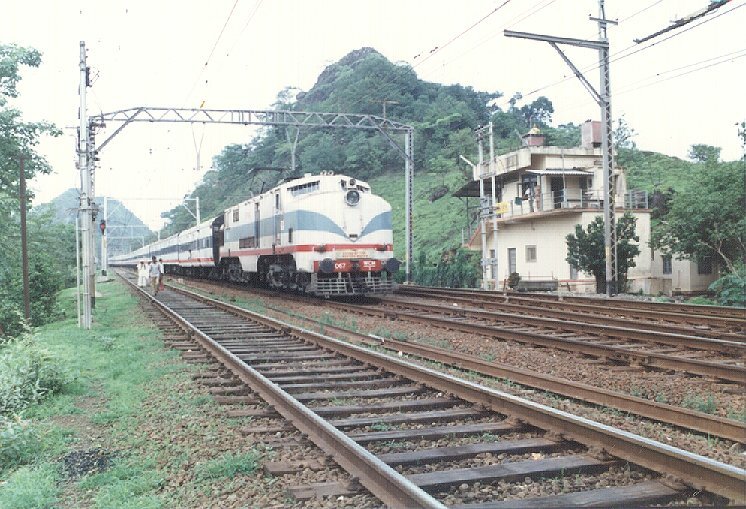 WCM 2 20068 brings the 6012 Up Chennai - Mumbai Express to a halt at the Khandala(KAD) station. This is the first of the three catch sidings and all trains stop here for safety reasons. 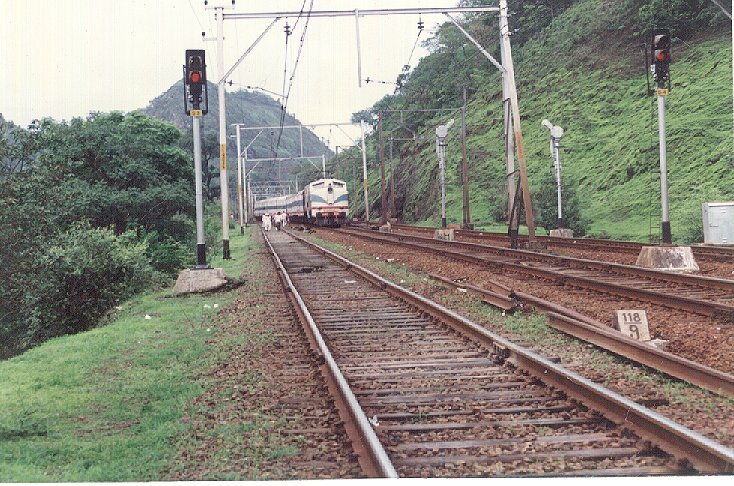 A pair of WCG 2 bankers wait at Khandala for the signals to clear. The local janata uses the bankers as transport in the ghats. 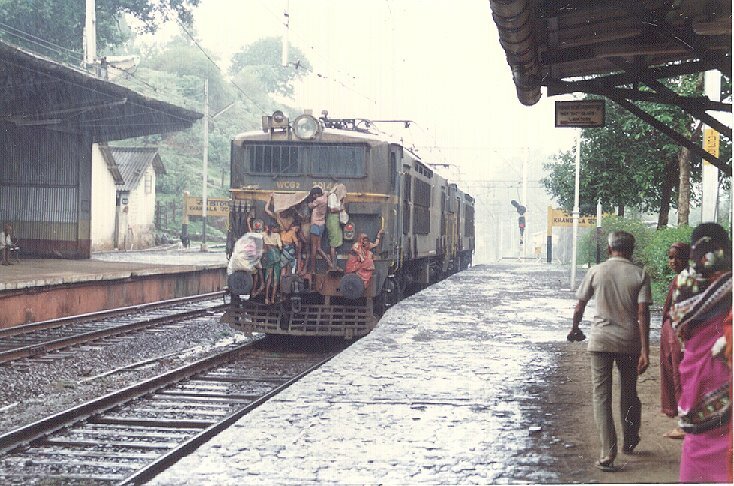 They do not get inside the cabs but have to endure the soaking rain on the buffer beam of this low geared, powerful but noisy loco. This is the point where most drivers bring out their tea flask and snacks. 6529 Dn. 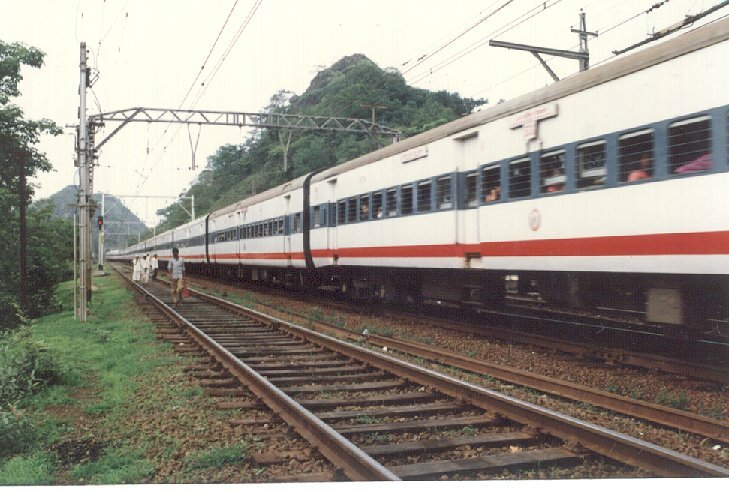 Mumbai Bangalore Udyan Express zips through Khandala. The WCG 2 bankers are only just visible. 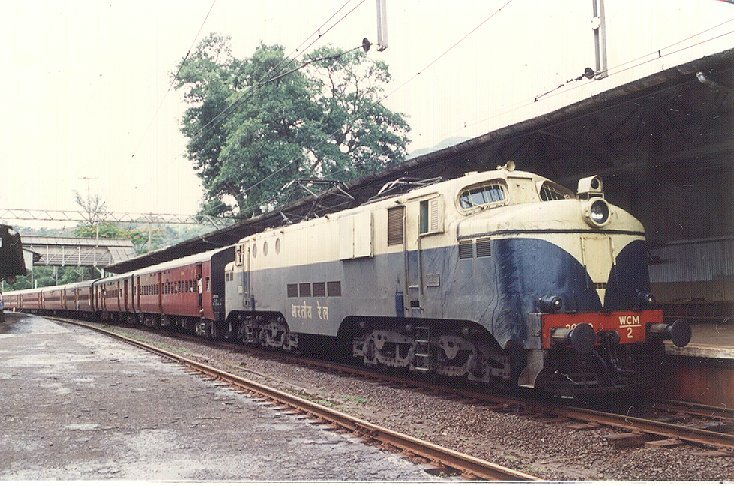 Sadly the train has no special livery anymore.